TOP LITTLE RIGGER: Nic Coops drop his locks to help raise funds for the Leukaemia Foundation. NIC Coops is one of our little riggers who was brave and shaved for the cure. The World's Greatest Shave which is run annually and raises money for the Leukaemia Foundation to help fight the disease. Nic's plight comes straight from the heart, at the start of March this year his great grandmother passed away from cancer after a seven-month fight. As soon as he heard the news of her passing and with only a week until the big shave day, Nic decided he was going to take on the challenge and raise money to help find a cure. "It was something I could do to help raise money to find a cure for cancer," he said. 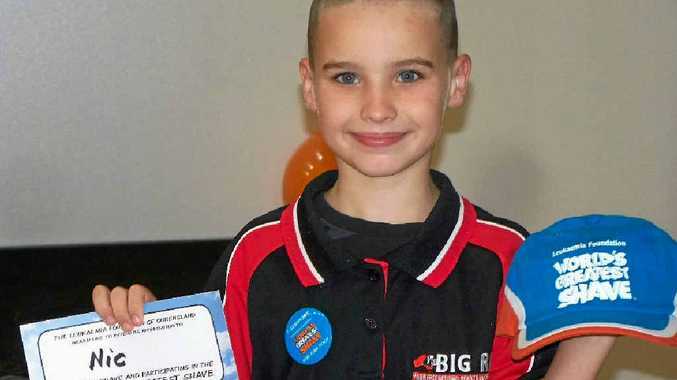 In one week the nine-year-old managed to raise more than $450 with a little help from friends, family plus a small donation from each staff member at Big Rigs. Nic didn't just colour his hair though, he went the whole hog and got it shaved. From everyone at Big Rigs well done Nic, that is a great effort. For anyone who missed the opportunity to donate, it's not too late. You still have until early April to donate for this great cause, and if you want to help Nic out all you have to do is go on to our Facebook page and scroll back through the past posts to see the link to Nic's page and all the instructions will be there to help you donate to a great cause. "It was something I could do to help raise money to find a cure for cancer."